Recover SharePoint database Triggers, Functions, Rules, Lists, Documents etc. 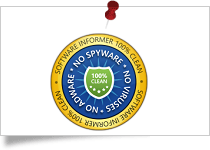 Software Informer gives SysTools SharePoint Repair tool 100% secure and clean award for its best perfromance among others. 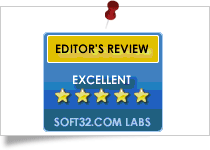 SysTools SharePoint File Recovery got the 4 stars rating from Cnet for its best working. Soft32 provides SysTools SharePoint data recovery tool 5 star rating for the most effective & efficient product to recover documents from SharePoint database. SysTools SharePoint database recovery tool allows to repair corrupt SharePoint .mdf files from sever corruption issues. It can restore all the lists, sites, documents, alerts, workflow state, associations, permissions, metadata, custom views, Web part links, etc. ; present within the SharePoint database. The Software helps to overcome corruption caused due to Virus attack, Trojan infection, etc. The sharepoint repair tool scans entire database. During this, you can view a summary report of the process. This summary report will show you MDF file details like: Pages read, database name, database version, count of tables, views, stored procedures, Rules, Triggers, functions. Save in SQL Server Database: You can directly export the recovered SharePoint database into SQL Server. SQL Server credentials are needed for this. 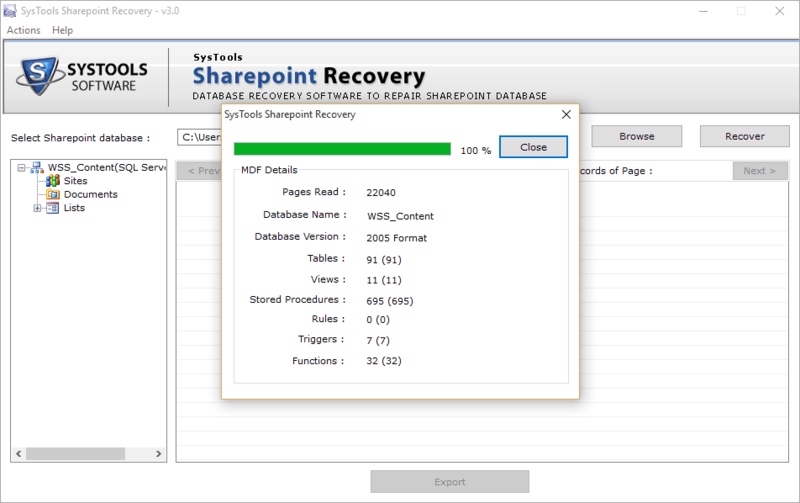 Extract SharePoint Documents: The sharepoint document recovery tool will save all SharePoint documents in a new .mdf file. 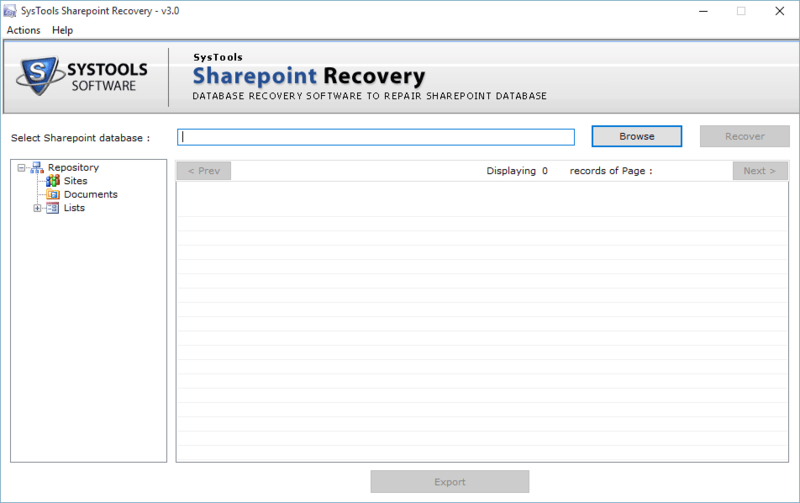 In order to recover SharePoint database, the SharePoint recovery tool performs quick scanning of file. After this, all items get listed so that you can preview them all with their associated attributes. These attributes include: Site ID, Full URL, Parent Web ID, directory name, Leaf Name, etc. 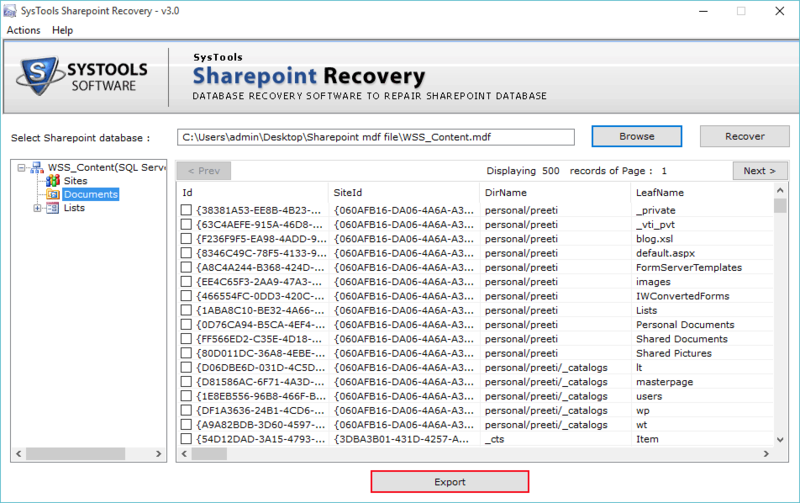 The SharePoint Repair tool allows you to check / uncheck items from recovered database for selective item export. This way, it becomes easier for you to save only limited amount of data that is important rather than unnecessarily saving them all. "The list cannot be displayed in datasheet view"
Is there any limitation on size of SharePoint Database? No, there is no limitation on the size of database. You can recover any size of database damaged or corrupted due to any possible reasons. Is SharePoint 2016, 2013, 2010 or 2007 installation needed to save recovered or export database? No, it is not necessary to have SharePoint installed on your machine to run the SharePoint document recovery tool to export SharePoint to SQL Server. 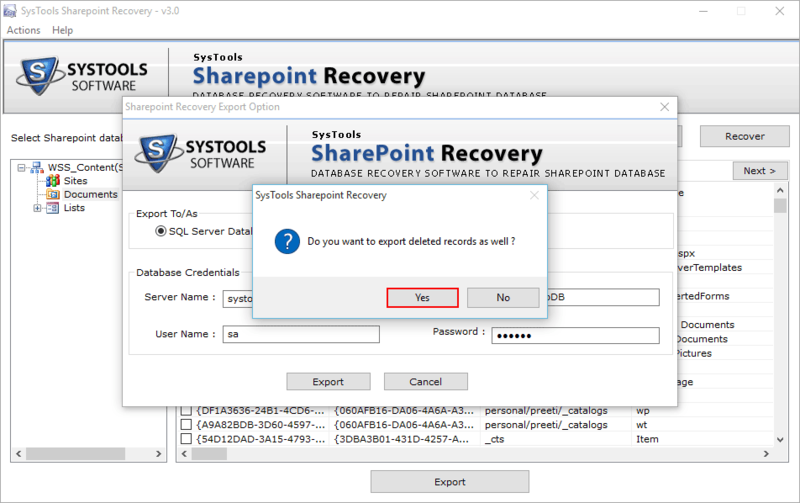 Using SharePoint repair tool you can scan and recover one SharePoint MDF file at a time. What are the different situations when SharePoint database (.mdf) files gets corrupted? Common situations when the Sharepoint database gets corrupted are incomplete backup, sudden power loss, server down, virus attack, unknowingly deletion of Sharepoint database file, trojan infection, hard disk failure, etc. It was difficult selecting the right SharePoint Recovery Software online to copy SharePoint to SQL Server. But it was only after a client suggested using your tool that he was able to export & repair corrupt SharePoint database without any hassle. So,I downloaded its demo version. And I can gladly say that I was so impressed with it that immediate purchase was made. Thank you! 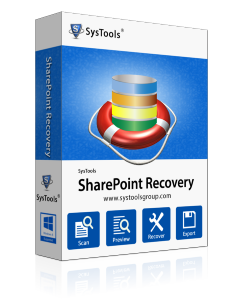 I would like to thank SysTools for the wonderful SharePoint database recovery software. No efforts were made and successful I was able to recover SharePoint database in no time. The creation of this tool and its properties are worth of appreciation.